T5 or T8? Which is better? Home › Information Guides › T5 or T8? Which is better? 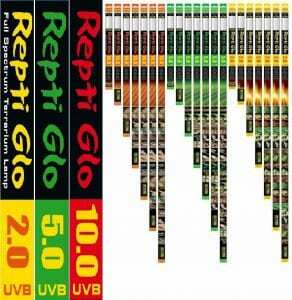 There is a lot of confusion regarding fluorescent tubes in the reptile keeping world regarding T5 and T8. So what is the difference? 2% or full spectrum – very low UVB output, but gives a similar colour spectrum to natural sunlight. 5-6% or rainforest power, ideal UVB tube for species that require UVB, but at a lower level, often found where forest species live. 10-12% or desert power, ideal for species requiring higher levels of UVB, for species that bask in intense levels of sun. The method of use is to pick a UVB output for the species you are keeping, this may mean a visit to your local specialist to ascertain the habitat the species you are keeping originates from. Some examples; species such as Water Dragons, Day Geckos and similar are suited to 5-6% – species such as Bearded Dragons, Bosc Monitors are suited to 10-12%. T8 tubes however give a very limited colour output, this can be seen with the blue tinge. They are supposed to be complimented with a 2% or full spectrum tube to balance the colour spectrum. This will give a psychological well being to any species and they will generally be happier and eat better. For each 5-12% UVB T8 tube, there should also be a T8 2% tube provided. There would need to be two controllers and fittings, or a double controller. The newcomer, with more recent technology, the T5 fluorescent tube is a much smaller diameter at 5/8 inch diameter. The T8 and T5 tubes are not compatible, not only are they a different size, the electronic controllers both tubes require to work are specific to the tube, a T5 controller will only “fire” a T5 tube, and a T8 controller only a T8 tube. Unlike T8 tubes, T5 fluorescent tubes are not available in 2% full spectrum grade, this is because T5 has the full spectrum element built into the one tube – when using a T5 UVB tube there is no blue tinge. One controller is required. The luminance of a T5, that is the “brightness”, is far greater in a T5 tube in comparison to a T8. Only requires one controller, neater fittings. Gives a longer lived UVB output. There is a high output 14% version, very suitable for uromastyx and similar. 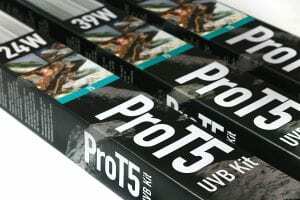 It may seem cheaper to provide a T8 fluorescent tube for UVB provision, but there are some downsides to this thought process. The T8 typical only gives a usable UVB output for around six months, a T5 will give a much longer and stable output of around twelve months. This means a T5 tube, over the twelve month period will be cheaper. The luminance levels from a single T5 tube is far superior than any form of a T8 tube, they are much “brighter”. A T5 tube will provide as close as possible luminance level to the sun, at this current time, out of all the fluorescent tubes. Not only is the purchase of a T5 tube better on the pocket, its also better for your UVB loving animals. The T5 tube is a clear winner, yet the T8 is still the best selling tube. It’s time for a rethink.